It's with a happy heart that I invite you to The White Barn at Lucas Farm. Matt and I own and operate a few businesses here in Oakland, Maryland that have helped us get where we are. The barn has always been a lifelong dream of mine and I was unsure if it would ever become more than that. Motivation, hard work, determination and our faith brought us to our forever farm. Matt and I were both born and raised in Oakland! We are locals. We know the town, the people, the community. We have spent our lives building friendships and relationships with people all over this small, tight-knit place we call HOME. In 2009, Matt and I purchased a bar and restaurant in Oakland, Maryland. We knew it was not going to be permanent, but it lead us to other business opportunities as well as new friends and contacts in the area. During the 6.5 years of ownership, we were able to learn, grow as a couple and as entrepreneurs in a small town. We organized some of the largest entertainment events in the area. We more than tripled our clientele and sales before we sold the business. As we started our family, we knew the bar life was not going to work with small children. We began working on our dream. I opened a home decor business approximately six years ago and began traveling the east coast for shows and expos. Using my talent and eye for design, I was able to vend at shows such as The Country Living Fair, The Springfield Extravaganza, Luckett's Spring Market, The Rural Society, The Vintage Home Market and many others. No matter how many shows I've done and will continue to do, something always led me back to the idea of the barn. We toyed with the idea for years, before we finally decided the time was right. In May 2016, Matt and I decided to purchase 40 acres in Red House. We purchased the farm from his parents that had been in the family dating back over 200 years. The 40 acres had been subdivided from the family farm in 2009. The fields were used for crops and to harvest sod for the family business. We always knew the landscape was picture-perfect and that the land was longing for something bigger. The picturesque views have always spoken for themselves. A sunrise that awakens the valley and a sunset that creates a beautiful, whimsical dream. So here we are! A few years have passed, 3 beautiful daughters later, a couple sold homes/businesses and we're still here. Bringing our dream to life. Creating a magical place for people to tie the knot and start their lives together. There is nowhere else I'd rather be. Thank you for taking the time out of your day to visit The White Barn. We hope you will give us the opportunity to host your special event and make your dreams come true. Brittney Lucas is the owner and designer at The White Barn. She appreciates old things that tell a story. She loves to re-create beauty with timeless pieces, both old and new. She works to create vintage charm with farmhouse flare. ​​Brittney's design preference is fresh and timeless. She loves the use of farmhouse pieces that are a glimpse of the past. She loves making old things new and seeing the potential in every design. Brittney was born and raised in Oakland, Maryland. She graduated from West Virginia University with a Bachelor's degree in Textiles and Merchandising, as well as a minor in Business Administration and a minor in Entrepreneurship. She was inspired to join the world of design while working in New York City for Ralph Lauren after graduation in Celebrity Public Relations and Design. Missing the small town feel, and the love of her life, Brittney returned home. Destined to do big things, Brittney set out on a mission to make her dreams a reality. After moving home from The Big Apple, Brittney took a job as an interior decorator for a local design company. Her job was to stage homes to sell. From this job, Brittney made future clients/friends who hired her back even after they bought their home. Her eye for detail and design can not be replicated or compared. In Spring 2015, Brittney attended The Country Living Fair in Rhinebeck, New York as a vendor for the first time. After setting up her booth for the weekend show, Brittney was notified that a piece from her booth was chosen to be published by Country Living Magazine. Her designs and craftmanship is magazine-worthy! 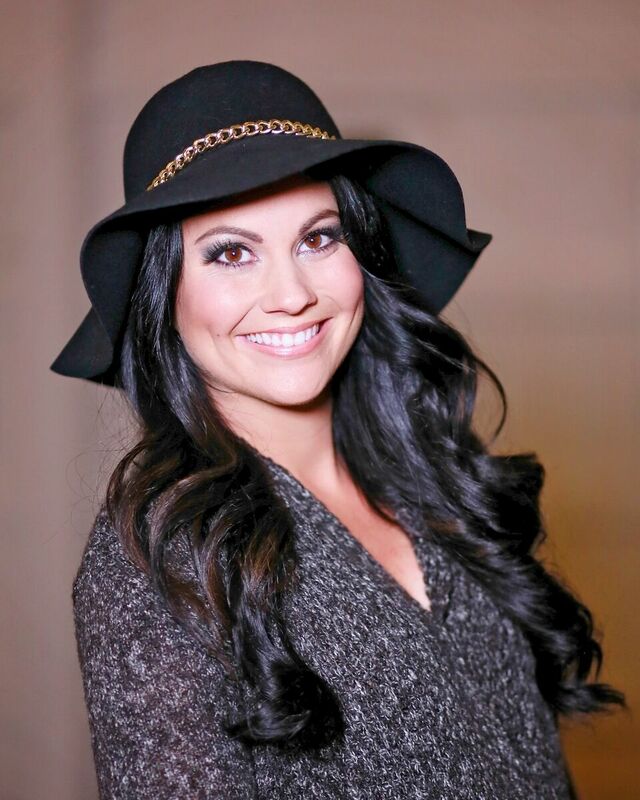 In between renovation projects, designing and decorating homes/weddings and running her other business, Enchanted Emporium, Brittney enjoys life on the farm and spending time with family. Fun-filled trips to junkyards, estate sales, flea markets and small-town shops are also a part of her favorite pastimes. Amongst many accomplishments in her life, her three daughters are her biggest blessing and Godsend. Your wedding will become Brittney's vision. She will spend timeless hours working for you and making your special day perfect. Her job and passion is to make you feel that your wedding could not be any more perfect. There is no detail that will be left out. Set up an appointment with Brittney! Learn what she's about. Tour the farm, view her collection of fun and inspiring pieces. Let her help you envision your perfect day. We promise when you meet her as a client, you will leave with a new friend. 2018 was the first full wedding season at The White Barn. Hosting 30 weddings and 15 events, the year was packed with special moments and several awards! 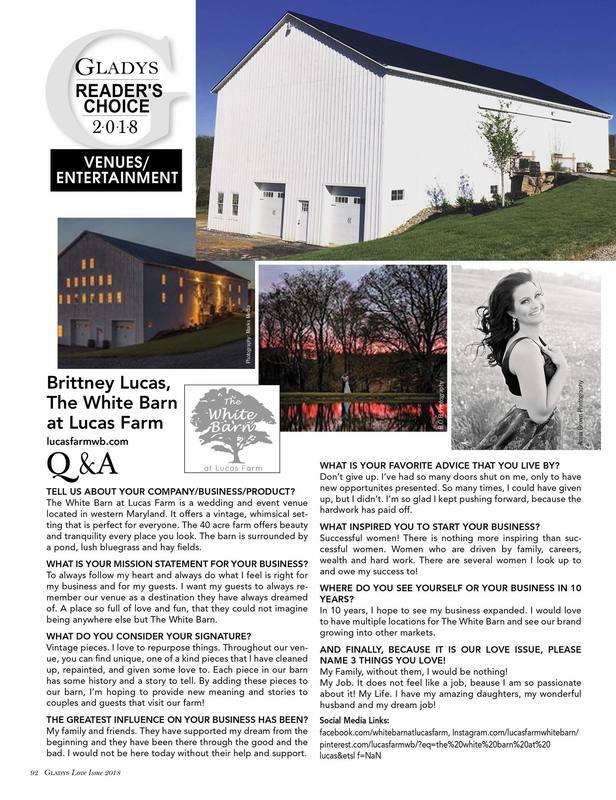 The White Barn was awarded "Favorite Wedding Venue" by The Deep Creek Times. Another huge recognition was from The Knot, the number 1 wedding brand in the country. The White Barn won "Best of Weddings", which only the top 2% in the wedding industry are awarded. The White Barn has also been featured in Gladys Magazine and Four Magazines (nationally-acclaimed magazines). The White Barn was also voted the 2018 Reader's Choice for Venues/Entertainment by Glady's Magazine. Recently The White Barn was also award the "Couple's Choice Award" for 2019 by Wedding Wire, one of the world's largest wedding platforms. Four Magazines also name The White Barn a 2019 Best Venue! 2019 is shaping up to be a great year. We have 40+ weddings booked, as well as several events and special occasions. We cannot wait to see what the new year brings!